Now that I’m working at Saveur I get to spend my whole day around food. I absolutely love it. It’s like a dream job that I never knew could be real, except it totally is! I am constantly taste testing, reading and writing about food, helping with shoots, and hanging out with some awesome people who couldn’t be more kind. The other day when I was cruising the web trying to find some news for Saveur.com‘s section Links we Love, I came across a grilled caesar salad and I was instantly hungry. I had never grilled lettuce before but it seemed like a fun thing to do so I tried it out. To my surprise, grilling romaine really mellows out the bitterness and intensifies the underlying lettuce flavor. 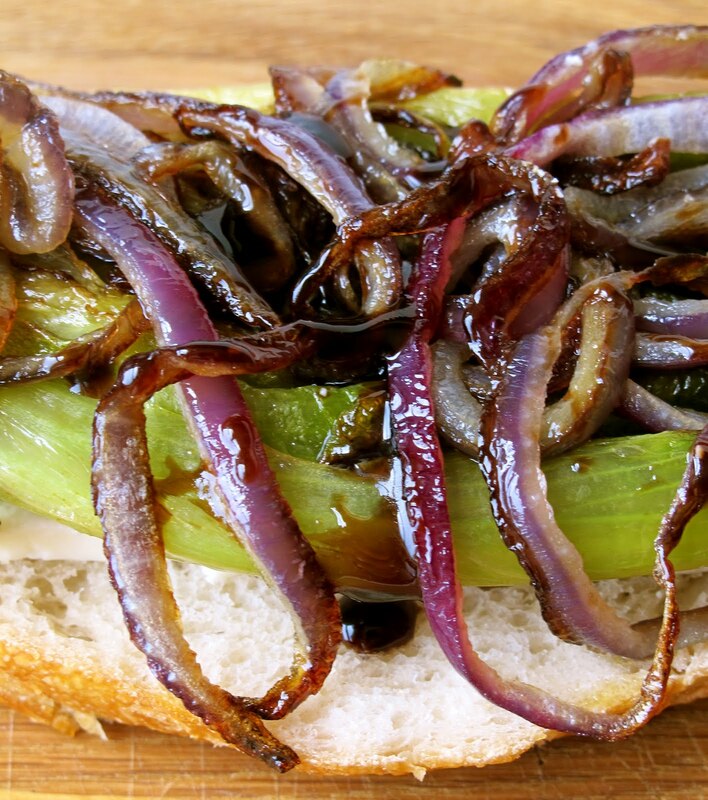 I decided to pair it with some sauteed red onions, feta, and balsamic glaze to give it a nice Greek twist. 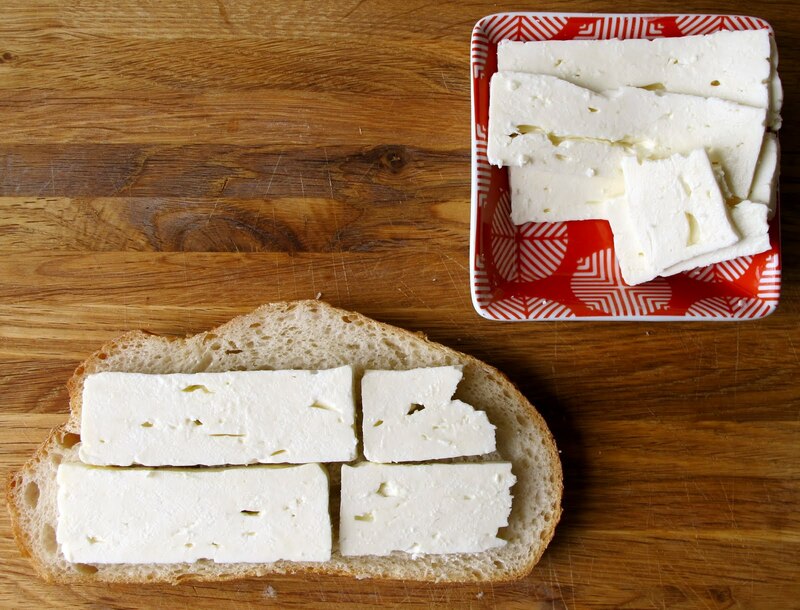 To begin, place a few thinly sliced pieces of feta on top of your sourdough. 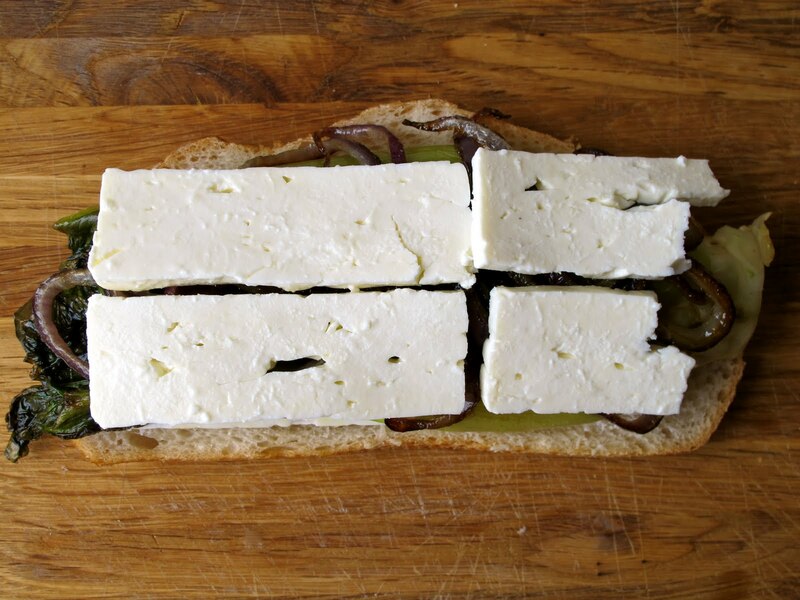 I love feta. It’s super salty but not too overwhelming and the texture is a weird mix between moist and firm. When you take a bite it’s like a salty ninja kicks you in the mouth and then hugs your tastebuds until you feel all better, well sort of. 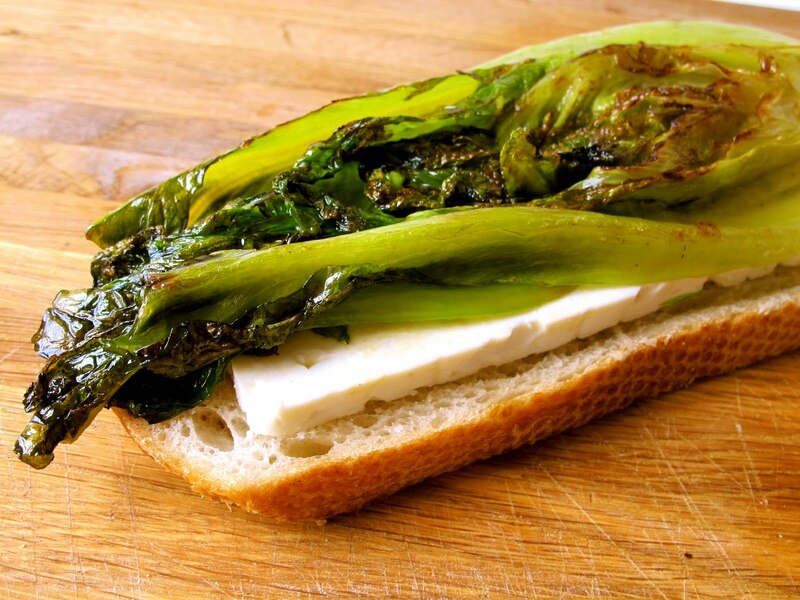 Then on top of that, delicately place your grilled romaine heart. This is actually my first time making/eating this and it was super easy. So if you’ve never done it before and you want some guidance, let me tell you how I did it. You basically begin by cutting a piece of romaine down the middle and cranking up your grill to a very high heat. Then drizzle some olive oil on top of your lettuce and place it on the heat. After a few minutes it’ll start to tenderize and caramelize at which point you’ll grind some peppercorns and crack some seal salt on top. 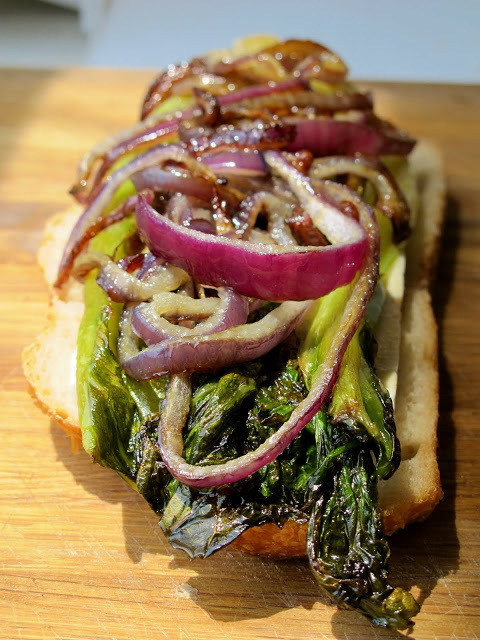 Place on some of those sweet and semi-crunchy red onions. Hit it with a few drizzles of balsamic glaze. I buy the pre-made kind because I am way too lazy use it way too often to have to make it for myself but I’d definitely recommend home-made reductions over the store bought kind. 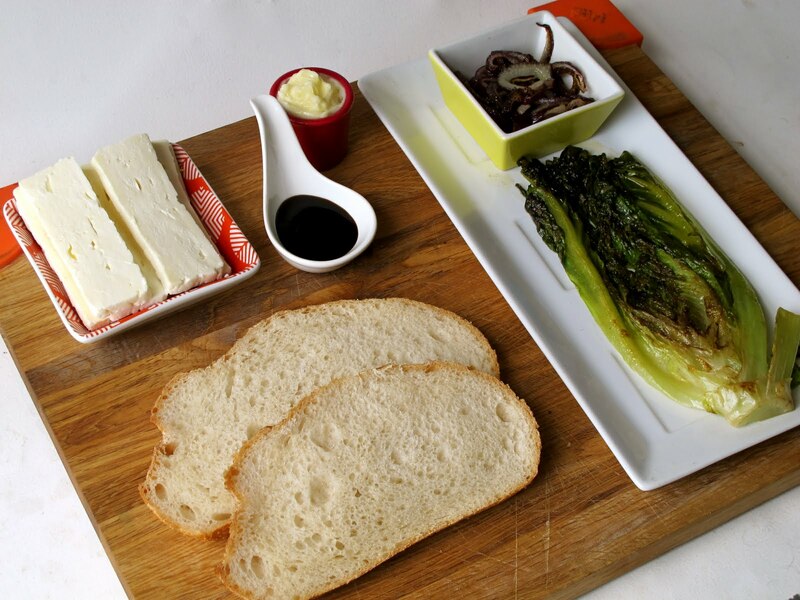 Then put a few more slices of the feta to create a glue which helps the ingredients bond together. Put your top piece of bread on and then smother it with some butter. 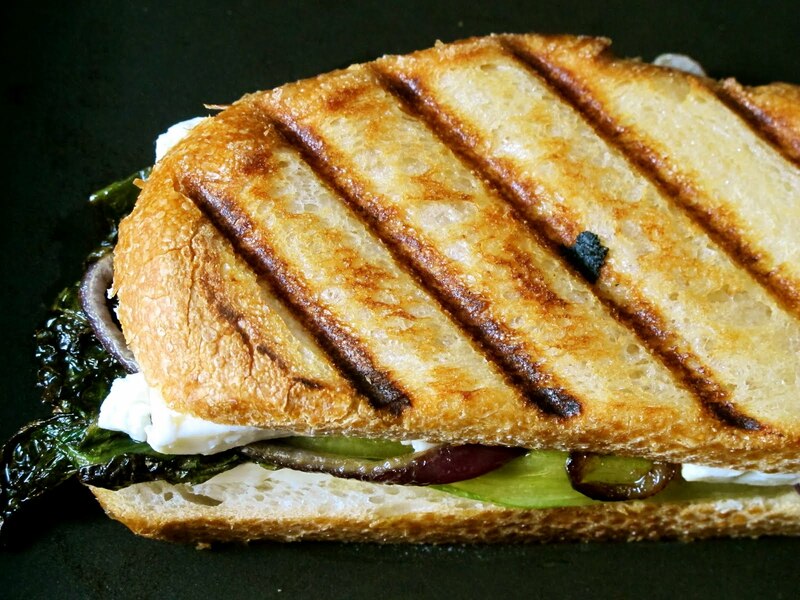 Before you put the sandwich on the grill, heat up your press on high heat for a couple of minutes. Meanwhile, heat your pan to medium high and melt some butter for the other side of the sandwich. 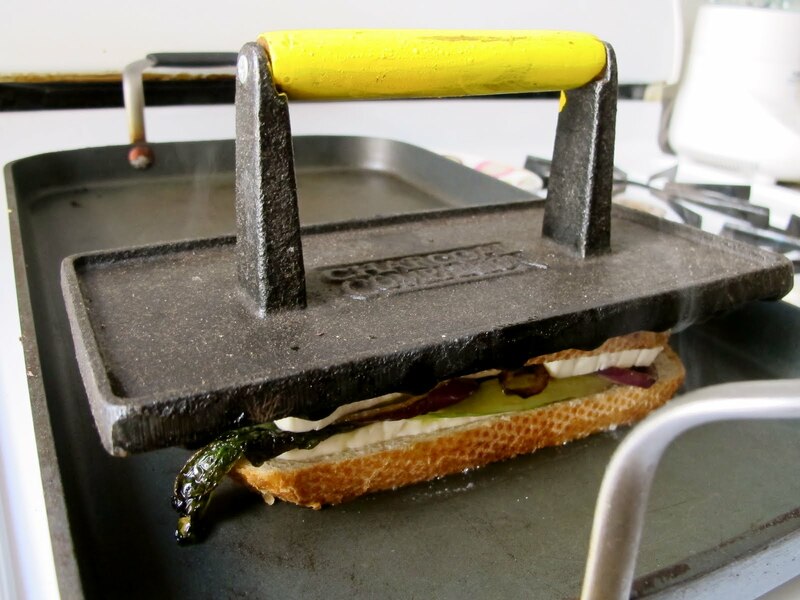 When everything is heated up (which should be about five minutes) place your sandwich in your pan and smush it with your press. I totally spaced when I picked up my press and didn’t think that the wooden handle would be burning hot, but it was, and now my hand is hurt. And I want my mom and a xanax. Make sure not to move it for a few minutes so you end up getting nice grill marks. I let mine sit on there for about four minutes before I flipped it and pressed the other side. And finally when it’s all golden and crispy on each side, take it off the grill and serve immediately! Now if only I had a nice glass of wine and/or were swimming around in the Greek Isles with some hot stud… I guess there’s always tomorrow. Good to see some love for the vegetarians. Congrats on the new job. I'm glad I discovered your blog. Grilled cheese is incredible and the photos make my mouth water every time I read one of your posts. I like how the recipes all use some different or out of the ordinary ingredient to really make them special. Interesting adaptation to the wonder that is the grilled cheese sandwich! Yummers! I never thought about doing a feta GC before. What was I thinking?! Yum, Kenzie! I will be waiting for samples on the next NSB visit! Good job! Congrads! 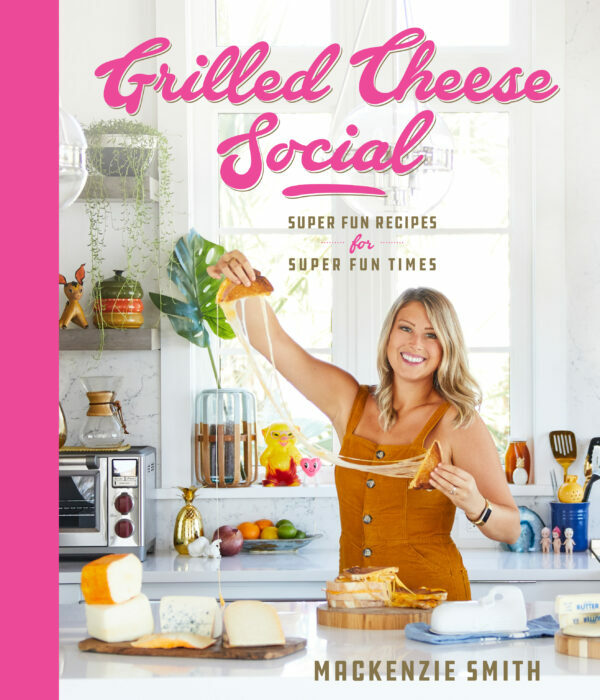 grilled cheese social- i love your blog. just added you to my side column. cheers. thank you for making me lick my monitor. if i close my eyes the dust almost tastes like feta. nothin betta fo real!! YUM! I agree with the Greek Islands thing. Most of the blogs I've read today have said something about a beach. It's torturous living in a land-locked state! I need sand and surf. I'll definitely be trying this recipe. I love absolutely everything in it. 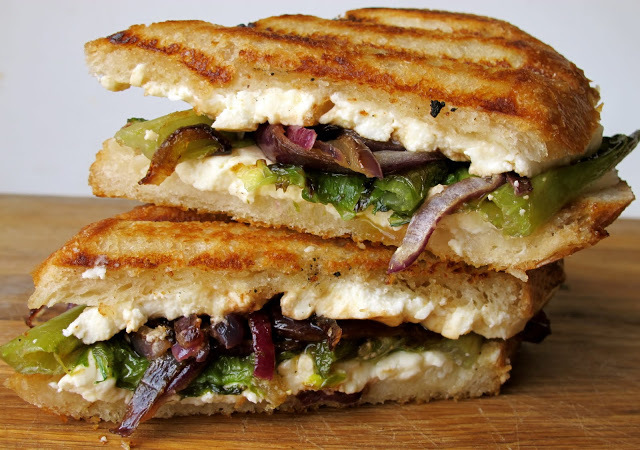 I love your blog (and grilled cheese) and I was so glad when I saw you posted a new sandwich today! Thank you! Yum! (As Usual.) And congrats on the new job at Saveur. Love that mag so I'll be watching for you there. Glad to hear you found a position so fast. crap this looks good. I love grilled cheese more than a human should. 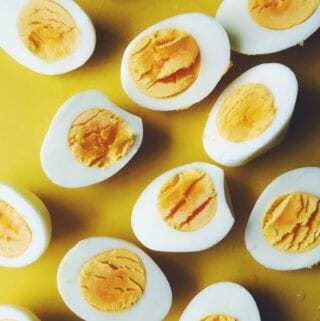 I wont get tired and fed up eating it everyday. I know what I am making for lunch tomorrow! 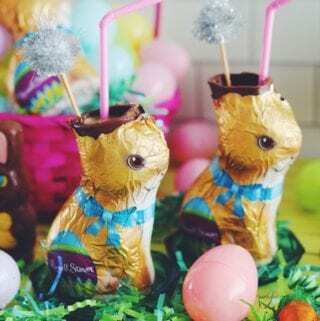 I haope you share this with WorkShop Wednesday! I love grilling lettuce–I agree, gives it such a unique flavor. 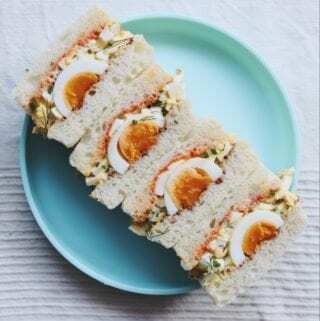 Great combination of ingredients in this sandwich. Mmm feta! Why not join us? ExposeYourBlog! great blog!!! i follow you. 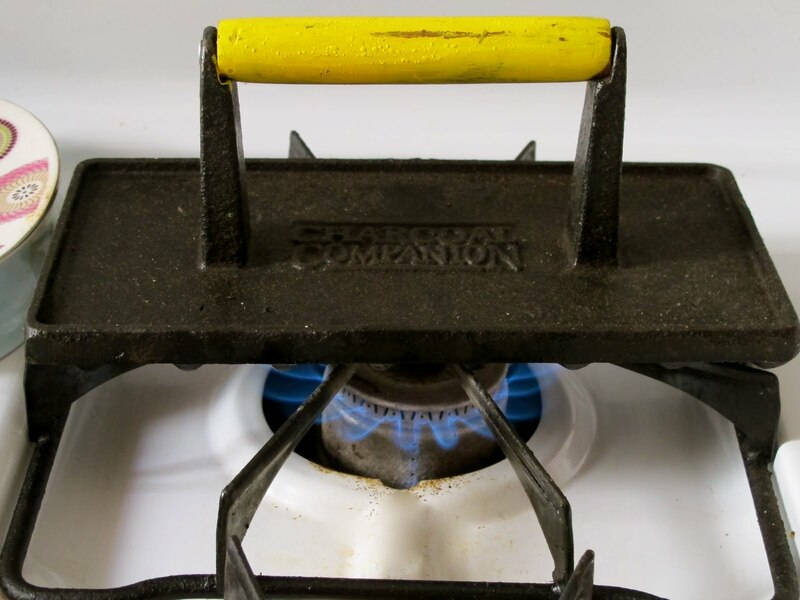 Is there any specific reason you sometimes use a press and sometimes just a pan? 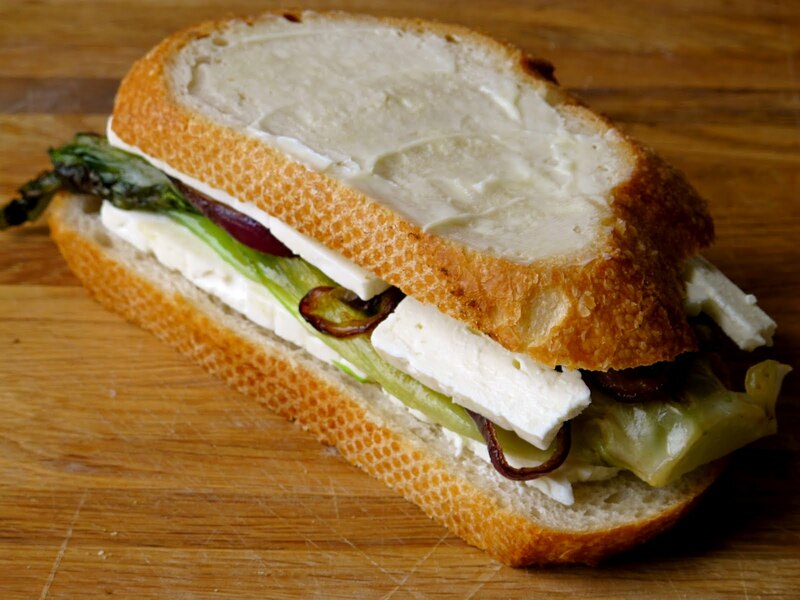 @sammy – I usually use a press when there's a bunch of ingredients that make the sandwich really tall. The press helps mash everything together and make them more compact. MacKenzie Smith is a 2 time Food Network Champ, Cookbook Author, Blogger, Cheese Expert and Executive Chef in New Smyrna Beach, Florida.